of the animals, or fog and rain are so heavy that viewers can hardly see the bears, much less make great photos. "Nature isn't predictable. That's why we call it 'wild'. those pits and recommend that you look for bears in another area, with another tour company. much less on glib sales pitches. Depend on preparation and on information. a short hike. Most can be reached only after a long hike and/or by boat or aircraft. pick the site and times that best meet your needs? below). Then use your answers as criteria for evaluating the suitability of each site during the weeks you will be viewing. What do I want to see bears doing? What is it about them that interests me the most? What other wildlife do I want to see? o Birds: eagle, puffin, etc. Do I want to photograph them, and if so, what quality of images would I like to have? 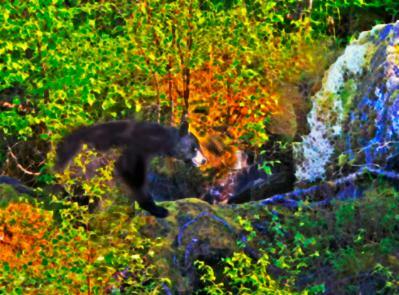 lens (10X is pretty much the minimum for bears), the farther away you can shoot and still get adequate quality images. a tripod to be able to distinguish individual hairs. camera mount on a C-clamp that can be attacked to a solid surface like a tree branch. 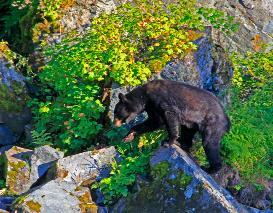 Natural history and science: What do I want to learn about bears, other wildlife, their habitats, and their ecology? spoor, etc., the more important it is view animals that are comfortable having people close by for hours or days on end. personality and enough natural history knowledge to entertain the typical viewer, but not enough to meet your needs. Spiritual/Mystical Experiences: Am I seeking a sense of acceptance by bears or even of spiritual kinship with them? Am I seeking recreation or 're-creation'? control the availability of harvestable game (e.g,. deer and bison), upon which the Natives depended for their survival. the Bear Viewing Association guide catalogue, which can be accessed below. prefer being in a bus or boat, or on foot in the wilderness? other viewers? Am I after a 'true wilderness experience" where our group doesn't see any other people? hours or even days of rain and overcast, high winds, or clouds of mosquitos and noseeums? Ideally use a camera that is weather proof so that dust and moisture cannot penetrate into either the camera body or lens. corrosion of electric junctions. This is especially critical near the ocean where tiny airborne water droplets can carry salt. plastic bag that is stiff enough to be used as a tent over the lens to keep rain off the lens surface. set up a tripod? Will I have to face into the sun or cope with strong glare off water? narrative descriptions in that book. What techniques can a view use used to minimize disturbance of wildlife? What techniques can be applied to minimize personal risk? or must you join a commercial tour? Which sites require a viewing permit? How is it obtained? How long in advance need you apply? each day? Or can you overnight nearby, for instance in a wilderness lodge? Is camping allowed and reasonably safe? electric fence and bear-resistant food containers).